1 bedroom/1 bath split vanity, sleeps 5+; 2 in the master queen bed, 2 on the comfy queen sofa sleeper and 1-2 on the full futon. Virtually a ski-in ski-out, a short 4 minute walk to the slopes. Located on the 1st floor, one flight up from back lot. Free Wi-Fi, in-condo washer & dryer, gas fireplace and unmatched customer service. Next to Unit 102 great for two groups. Once you park your car, it a short 4 min walk to Pioneer Glade (beginner ski run) and an 8-10 minute walk and/ ski beside the Rio Hondo River to purchase your lift ticket, catch the main base lifts, catch the gondola to the Kid’s Center, rent the latest ski and snowboard equipment, purchase those new warm mittens, or sit beside a cozy fire for a mulled cider, snacks and a great meal. The St Moritz complex was newly built 2011 with high end furnishings and appliances throughout. It is luxurious, inviting and is designed to make you feel at home. It is a place to bring your family and friends to get away and relax. It is quiet, off the main tourist path and has amazing views. The kitchen has granite counters, stainless steel appliances and is fully equipped for your cooking and baking needs. Outside, there is a gas grill for your enjoyment. You will find a washer and dryer with all needed laundering and cleaning supplies in the unit’s laundry room. A 5-6 USB port charging station. A 46' HD TV with satellite and Blue Ray DVD will keep you entertained. While FREE high speed Wi-Fi internet will keep you connected to the outside world. Down comforters and a variety of pillows will keep your nights’ restful. A one-touch gas fireplace keeps the nights’ cozy and inviting. Elegant stone work adorns the fireplace and bar. Travertine tile on the floors give a touch of class yet are easy to keep looking nice and are indestructible. Carpet in the bedrooms will help keep your toes toasty. Electric baseboards quietly heat the unit, maintaining each room at a constant, even temperature. The bathroom baseboard heating unit is separately controlled. On the same level and just around the corner you will find your own lockable equipment storage closet to secure your skis, poles and snowboards. Unit 102 is next door, another 1 bed/ 1 bath and sleeps 5+. Great for two families or group trips. 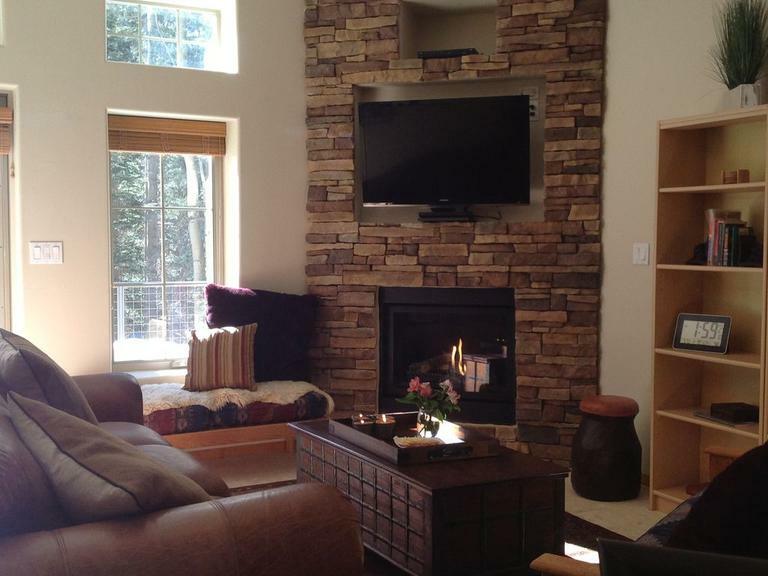 St Moritz Condos are nestled in the European style alpine NM Taos Ski Valley at 9,500 ft. The historic Village of Taos, recently rated by Fodor’s Travel as one of the Top 10 “Best Solo Escapes This Winter,” and by Yahoo as one of their Top Five “Best Destinations for Christmas,” is a scenic 20 minute drive. The surrounding area offers the visitor many interesting historical and scenic sites as well as many cultural and sporting opportunities. Free Hi speed Wi-Fi password protected in each Unit, Free permitted uncovered parking for 1 car, Gas fireplace in each Unit, Baseboard heat in each room, Breakfast basket provided, Luxurious linens, Washer & Dyer with soap and dryer sheets provided in each Unit, 4 rolls of T.P. in each bathroom, cleaning supplies provided too. Kitchen is supplied with: 12 c. drip coffee maker with grinder and filters, 2 rolls of paper towels, 8 set of dishes and silverware, Dishwasher: dish washer & dish soap provided, trash bags, spice rack, Tin-foil, qt & gal zip-locks, Microwave, elec. stove & oven with all the pots & baking pans, good sharp knives and a spice rack. Community deck with views with a shared gas grill. Snowboard & Ski equipment secured closet on the 1st floor for each Unit. Unmatched Customer Service; hours are 24/7 during your stay. Resident Manager on site. Please feel free to get a hold of me anytime when you are here and need anything or have any questions. 1 bedroom/1 bath split vanity, sleeps 5+; 2 in the master King bed, 2 on the comfy queen and 1-2 on the full sofa sleeper. Virtually a ski-in ski-out, a short 4 minute walk to the slopes. Located on the 1srt floor, one flight up from back lot. 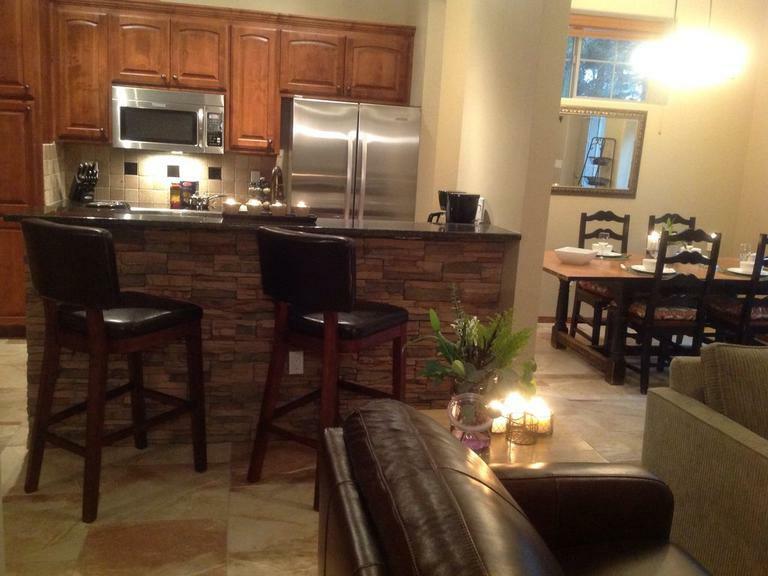 Free Wi-Fi, in-condo washer & dryer, gas fireplace and unmatched customer service. Next to Unit 101, great for two groups. The St Moritz complex was newly built 2011 with high end furnishings and appliances throughout. It is luxurious, inviting and is designed to make you feel at home. It is a place to bring your family and friends to get away and relax. It is quiet, off the main tourist path and has amazing views. The kitchen has granite counters, stainless steel appliances and is fully equipped for your cooking and baking needs. Outside, there is a gas grill for your enjoyment. You will find a washer and dryer with all needed laundering and cleaning supplies in the unit’s laundry room. On the same level and just around the corner you will find your own lockable equipment storage closet to secure your skis, poles and snowboards. 2 bedroom/2 bath, sleeps 5; 2 in the master bedroom King bed (splits into 2 twins) and bath, 2 in queen bed 2nd bedroom and 1 on comfy couch in livingroom. Virtually a ski-in ski-out, a short 4 minute walk to the slopes. Located on the 3rd floor, one flight up from front lot. 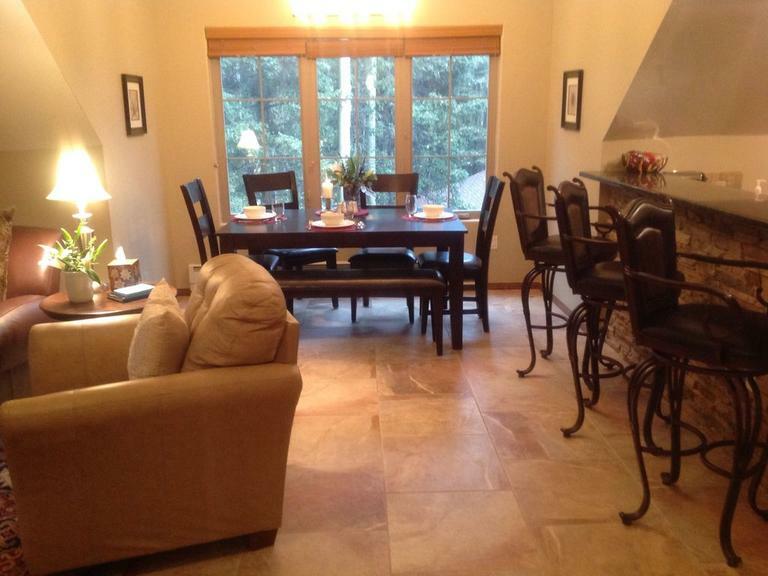 Free Wi-Fi, in-condo washer & dryer, gas fireplace and unmatched customer service. Next to Unit 302 and 402, great for groups. On the 1st level you will find your own lockable equipment storage closet to secure your skis, poles and snowboards. Unit 302 is next door, another 2 bed/ 2 bath (sleeps 7) and Unit #402 a 1 bed/ 1 bath (sleeps 4). All three condos front doors are on the 3rd level. Great for tgroups or hree families. 2 bedroom/2 bath, sleeps 7; 2 in the master queen bed with bath, 3 in the bunk bed with a full under a twin in 2nd bedroom and 2 on the comy queen sofa sleeper in living room. Virtually a ski-in ski-out, a short 4 minute walk to the slopes. Located on the 3rd floor, one flight up from front lot. Free Wi-Fi, in-condo washer & dryer, gas fireplace and unmatched customer service. Next to Unit 301 and 402, great for groups. Unit 301 is next door, another 2 bed/ 2 bath (sleeps 7) and Unit #402 a 1 bed/ 1 bath (sleeps 4). All three condos front doors are on the 3rd level. Great for groups or families. 1 bedroom/1 bath, sleeps 4; 2 in the master King bed, 2 on the comfy queen sofa sleeper. Virtually a ski-in ski-out, a short 4 minute walk to the slopes. Located on the 4th floor, two flights up from front lot. 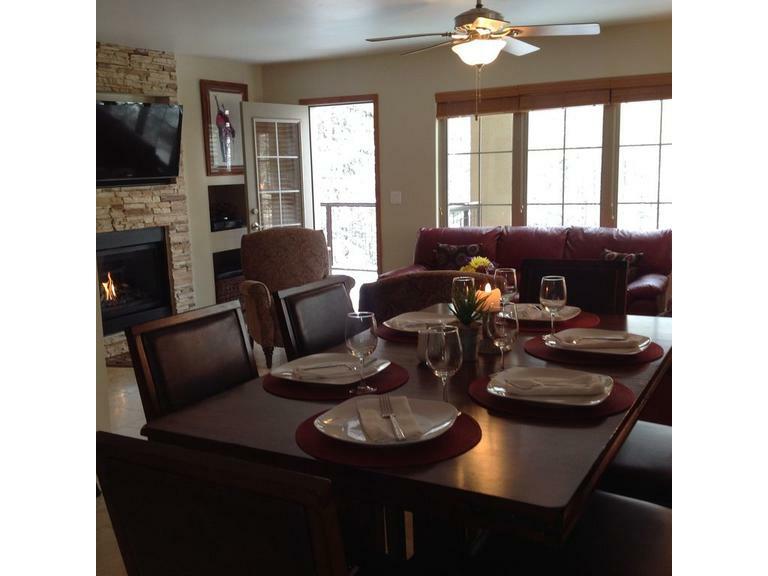 Free Wi-Fi and in-condo washer & dryer, gas fireplace and unmatched customer service. Next to Unit 301 and 302, great for groups.